Have you ever been driving down the street or highway and felt like you were going to fall asleep? There’s a good chance you have, and there’s an even better chance you told yourself you could handle it. Sadly, falling asleep at the wheel, otherwise known as drowsy driving or driver fatigue, is extremely common, and it’s extremely dangerous. 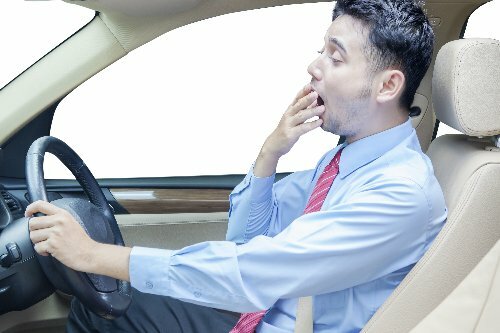 The National Sleep Foundation reports that 60% of Americans say they’ve driven while feeling sleepy, while 37% actually admit to falling asleep at the wheel in the past year. Let me repeat that … 37% have admitted to falling asleep while driving! Car accidents are responsible for nearly 34,000 deaths every year, and a fair chunk of those are from drowsy driving. Fatigue while driving can impair your judgment and reaction abilities as much as alcohol can. Make sure your seat is adjusted so you’re sitting straight up. This signals to your body that you’re active and engaged. If you’re leaning back or slouched over, the signals are passive and you’re more likely to get drowsy or nod off. Turn on some music you like that will get you active and engaged. Sing along and even dance if you have to; just make sure you keep your focus on the road! There’s nothing wrong with pulling over to take a break if you need it. Getting out and walking around for a few minutes, getting a breath a fresh air, or even taking a little nap can all help ward off the effects of fatigue. DON’T play a game on your phone because distracted driving is dangerous; instead, use your surroundings to come up with a way to keep your mind active. Keep track of things you’re seeing and find a way to categorize them to stay engaged. I can’t put enough emphasis on this: drowsy driving can be as dangerous as drunk driving, so make sure you know how to handle fatigue behind the wheel. Do your best to stay awake and engaged and avoid autopilot. May, M., “Car Tip: How to Prevent Highway Hypnosis,” The Journal.ie, August 29 2016; http://www.thejournal.ie/how-to-prevent-highway-hypnosis-2947617-Aug2016/, last accessed August 31, 2016. “Accidents or Unintentional Injuries,” Centers for Disease Control and Prevention, July 6, 2016; http://www.cdc.gov/nchs/fastats/accidental-injury.htm, last accessed August 31, 2016. “Drowsy Driving,” National Sleep Foundation, 2016; https://sleepfoundation.org/sleep-topics/drowsy-driving, last accessed August 31, 2016. “Key Messages/Talking Points” National Sleep Foundation, 2016; https://sleepfoundation.org/sites/default/files/Drowsy%20Driving-Key%20Messages%20and%20Talking%20Points.pdf, last accessed August 31, 2016.